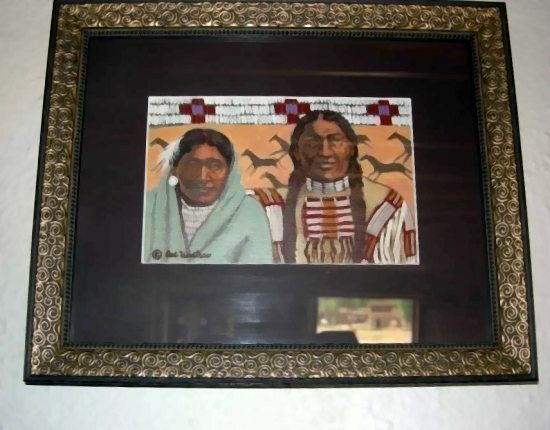 With Valentine’s Day two days away, it seemed like a good time to revisit one of my favorite pieces by one of our other Native artists, one that beautifully illustrates his people’s wedding traditions. It’s a small painting by Carl Winters (Standing Rock Sioux), entitled She Cost Me Seven Horses. For someone as independent in my identity as a woman, that might seem unlikely, but the dominant culture’s interpretation of indigenous practices that might be called “dowries” or “bride prices” tend not to reflect the reality of the balance of power in such relationships with any real accuracy. Traditional cultures often had — and have, today — sharply delineated gender roles, at least with regard to certain aspects of daily life. The existence of such roles, and the associations and powers attached thereto, are not by definition “sexist,” even as the dominant culture defines that label. They’re simply different. And in fact, in many Native societies, women actually had far greater equality of and diversity of opportunity than their counterparts of European ancestry. Ironically, this was, of course, one of the aspects of our cultures that led invading Europeans to label our peoples “savage” and “uncivilized.” Women didn’t know their place. They had rights — rights that existed independently of their husbands and fathers. Indeed, in the tradition from which this painting comes, women had (and have) significant power over the status of the male chiefs, with the singular ability to take that status away. In the same vein, gender roles have carried differing responsibilities, but not automatically loss of status. In cultures whose interactions were based largely upon concepts of trade rather than purchase, of seeking coexistence before pursuing colonialism or capitalism, exchanges today dismissed as “dowries” or “bride prices” were far less a transaction in which a woman was bought like a piece of property than complex geopolitical negotiations that often occurred with the woman’s free and informed consent. To outsiders, it perhaps seems as though two families (or two peoples) were purchasing “prosperity” or “peace” on the back of a woman’s body, but the dynamics were far less crude than were the corresponding transactional underpinnings of European marriages. Again, there’s that pesky European connotation of proprietary (and property) rights. But in cultures where women were assumed to have sexual agency and the ability to decide for themselves whether a man was worth an investment of time (and body), what people would today politely call “arranged marriages” often required the woman’s full consent. Mutual attraction, even love, was likely present far more often than in the marriages of colonial counterparts, even when the colonial nuptials were between people with no leadership status in their communities and thence no political ramifications beyond their respective family units. In many indigenous cultures, too, women inherently possessed a right of divorce, a concept utterly unthinkable among the settler population. Native peoples tend to be, at bottom, eminently practical, and in many societies, this extended to family arrangements. In some cultures, including that of this artist, there exists a tradition of “making relatives” that has nothing to do with marriage, but everything to do with brotherhood, friendship, community, and geopolitical strategy. Beyond that, in many Native traditions, marriage relationships involved far more inherent autonomy and personal sovereignty that their European counterparts, for women and men alike: Marriage was an important institution, of course, but people were practical enough to understand that what works for everyone at one stage of life perhaps does not work so well (or not at all) down the road. In some cultures, subject to certain requirements, one or either party could end the relationship and remain a full-fledged citizen in good standing, without the stigma attached to divorce (especially for women) found in European cultures. Here, it’s a manifestation of the bride’s power and status that she can, by her willingness to join another family or people, command a gift of seven horses for her own family. And knowing as I do the artist’s culture, I have no doubt that she made sure to exercise that power in a way that maximized its effect. After all, the artist comes from a culture in which it is the women who can relieve a chief of his status and power and the accompanying symbols. And so, to me, the salient element of the piece is not the proud expression of the husband; it is the secret little smile, barely expressed but visible nonetheless, of the wife, satisfaction touching her face ever so slightly as the seven horses gallop across the background to their new home with her family. In a time when we all walk in two worlds, and when the outer world bombards us with commercial artifice that wraps itself in the blanket of something it calls “love,” it’s useful to remember that there is no one way of doing things, and that our own lives and loves need adhere to no external ideal. Love manifests itself in highly individual ways, and the outside world holds no veto power over how members of traditional cultures choose to express it. After all, our own cultures have withstood the test of thousands of years of existence, and in the last half-millennium, a concerted campaign to exterminate them entirely. The fact that love survives, and thrives, in the face of such history is testament to its power, however it finds expression. Posted on Thursday, February 12th, 2015 at 4:34 pm. Filed under: The NDN Silver Blog Tags: The NDN Silver Blog	RSS 2.0 feed.